Locks file cabinets that do not have a built-in lock. Replaces a built-in lock that you have lost the keys to. 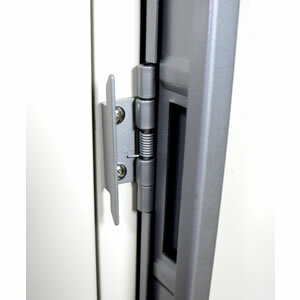 Provides a second layer of security to an existing built-in lock. 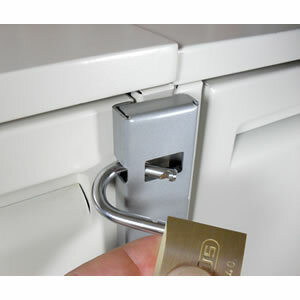 This File Locking Bar is the most popular filing cabinet lock on the market for a reason. It doesn't matter if you are a big company, a small company, or just need to secure your files at home from prying eyes; you all asked us for the same things. 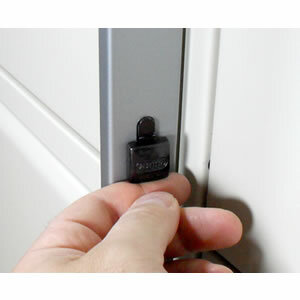 You wanted a file	cabinet lock that would be easy to install, built tough, and backed by a company you can rely on. You can be confident that we have provided all of those things and we put our money where our mouth is by offering free return shipping with a couple of clicks of your mouse if for ANY reason you don't agree. 1. Is it Easy to Install? "Straight forward installation. Easy to follow instructions. We bought the ABUS padlock also to make sure it would fit. This product definitely met our expectations and we highly recommend it!" "It arrived promptly and was easy to install. It's a good heavy weight and feels very secure. Originally, I was looking for the type that slides down the handles but that type was almost double the price and then you'd be installing and removing it each day. This is easy to open and close and you never have to store it during work hours - it stays attached. We would definitely buy this product in the future. We also bought the padlock by the same manufacturer that was recommended. It has a heavy and secure feel to it also." But if you don't believe them, let me show you myself! This video shows you how the locking bar works, how to decide which side of the filing cabinet to put it on, then how to install it. It takes less than 5 minutes to install the locking bar, but if you only want to see how the file locking bar works for now, you can just watch the first couple minutes of the video. 2. Does it FIT your Filing Cabinets? 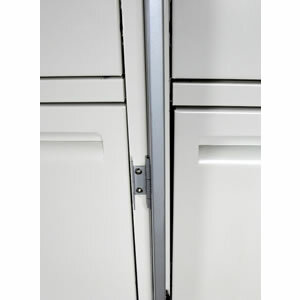 The file locking bar attaches to the small strip of the cabinet that is NEXT TO the drawer, shown in this picture. It can attach to either the left or right side of the cabinet. You must have 1/2" of frame to attach the bar to. 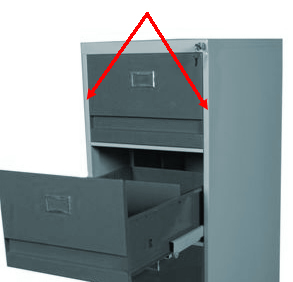 If your file cabinet drawers go all the way to the edge like in this picture, then there is nowhere to attach the bar. 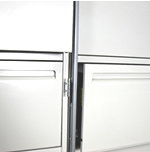 Please see our refrigerator lock kits which can 'double' as a drawer lock! Oh, and don't worry about it getting in the way of the file cabinet next to it. 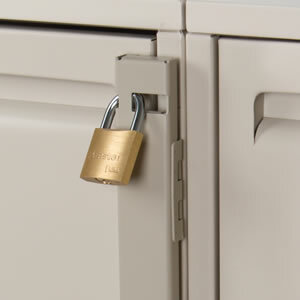 When it is unlocked, it swings open to fit neatly in the space between so that the drawers on both filing cabinets can open without obstruction. MLK-1c For a 1 drawer file cabinet Gray 12"
MLK-2c For a 2 drawer file cabinet Gray 22.5"
MLK-3c For a 3 drawer file cabinet Gray 34.5"
MLK-4c For a 4 drawer file cabinet Gray 46"
FLB-204P For a 4 drawer file cabinet Beige 46"
MLK-5c For a 5 drawer file cabinet Gray 56.75"
3. Is it Well Built? 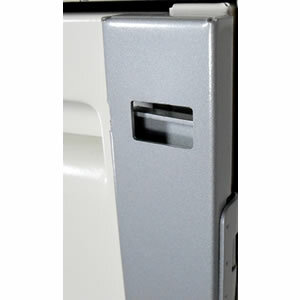 To make sure that the file locking bar can't be pried off, we use only heavy duty 16 gage formed steel. 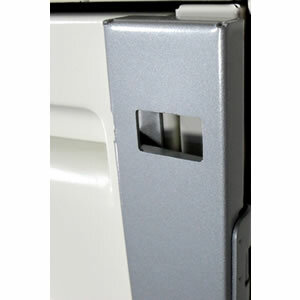 By making the security device much stronger than the cabinet it is attached to, you would literally have to rip the side of your file cabinet off before you would bend the locking bar! It even complies with the NISPOM government standards for the protection of classified information! With some locking bars, you have to find a place to store them during the day. Not these! With ours, it stays attached and just easily swings out of the way. Using the file bar is simple. 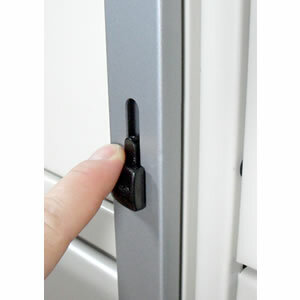 While the file locking bar is open, one of the center hinges is spring-loaded so it is held open and won't accidentally close and interfere with your drawer opening. When the file bar is open, it does NOT interfere with the drawers on the adjoining file cabinet. Close the bar. The padlock hole is blocked until you lower the handle. Push the handle down, locking the cover onto the hinges. The padlock hole is now open and ready for the padlock. Your files are now secure! Our clients continually choose our file locking bar over our competitors' because it meets these important needs so well. We are so confident that you will agree that we make it super simple (and free) to return the product if you don't. If you have any questions at all, please call us right away at (800) 466-7636.